There are a few ways ordinary South Africans can earn money on the internet without investing any of their own money. All you need is an internet connection to work on the internet. Now I do not promise you that you will earn a lot of money, but If you do this long enough, you might just earn enough. Let me introduce you to Affiliate Marketing. Affiliate Marketing is a type of performance-based marketing in which a business rewards one or more affiliates for each visitor or customer brought by the affiliate’s own marketing efforts. One such company in South Africa that makes it real easy for South Africans to earn money is Mantality. 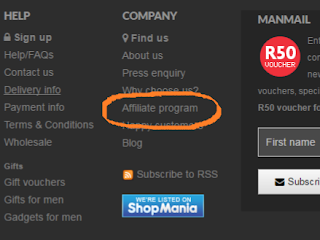 All you need to do as an Affiliate is advertise their products which Mantality is selling on their website. That is all. You do not need to buy products. One easy way to advertise these products is on Facebook. Mantality gives you the referral link which you then paste on Facebook and if someone clicks on this link, they are redirected to Mantality's website. When the person you refer to Mantality buys something on their website, you as the referrer earn commission. Click here to go to Mantality's website. At the bottom of their home page, under the sub-heading "Company" click on the "Affiliate Program" link. See photo below. Read through the introduction page which will explain in more detail how their referral program works. At the top of the page click on the "Signup now" button which then takes you to the application form. Once you completed the application form and after you are accepted for their referral program, you will receive your referral ID. Click here to continue and I will explain how to use your referral ID.